Do Youtube Videos Qualify You to Cut Hair? “Can I learn to bartend taking an online bartending course?“ This is a question that comes up quite often from those looking to break into the hospitality industry. These are people that are looking for the cheapest way to become a bartender. Online courses are not easy though, and they don’t hold you as a student accountable. They can’t tell you what you are doing right, and what you are doing wrong! The easiest path to becoming a bartender is through proper training. Learning how to properly cut hair is done in a school, and so is learning to bartend. A professional instructor that has been a bartender and learned what the challenges are with individual students is by far the best way to get started. Practicing your pouring skills and making cocktails in a truly hands-on training environment is essential. Think about it. 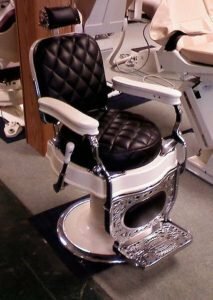 If you walked into a barber shop, or hair salon, and the person with the scissors said, “Hey, have a seat. It’s my first day and I watched some cool videos last weekend on how to cut hair. I have a couple things I want to try on you.” Of course, you would, and probably should just walk out the door! We know online courses are cheap. If you jump on that Groupon and spend the $39.00 for that an online training course, then watch all the videos… does that make you a bartender? You print the certificate of completion, but you know you still really don’t know if you really made that Singapore Sling correctly. You also know the Whiskey Sour they showed you wasn’t anything like what you ordered last weekend. Are you really ready to go conquer the world as a bartender? We know you aren’t, and so do you. Understood? The odds of someone with only some Youtube viewing experience getting hired are slim to none. They just don’t have any real world hands-on bartending experience, and managers wonder why these people waste their time. Online bartending course creators are interested in sales only, and not whether the students are trained well. Information is good, but ultimately hands-on practice is key in starting a career as a bartender. Fine Art Bartending has designed a hands-on bartender training program. There is no substitute for real world training and after 35 years of training bartenders in Vancouver, we know what bars and restaurants need in this city. We know you need to be up and behind the bar, working on your drink recipes, speed and pouring accuracy. 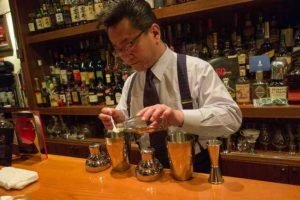 After a couple weeks of learning cocktail recipes and practicing efficiency techniques, you will have the confidence to bartend anywhere in and around Vancouver! No two bartender certification programs are created equal. Spend the time and look at how much practice time each bartending school offers. Fine Art Bartending has schools across Canada, and more than 45 years of training many different people on how to become a bartender. In Vancouver, we are the most renowned bartending school amongst bars, pubs and restaurants when they are evaluating new staff. We really enjoy seeing second generation bartending students come through our school. Parents that took the bartending classes way back when they were only 19 that remember how it was a great career option! Our bartender certification program will open doors for you everywhere. That’s something an online set of bartending classes can never do, across Canada or overseas. Land that dream job as a bartender? Serving staff can be flakey. The hospitality industry is full of individuals that are constantly moving on. Bar and restaurant owners don’t have the time to properly train bartenders. Things are different now. Starting as a bus boy, then expediter and eventually a bar back is a long a tough slog. Waiting for that opening to work as a bartender can take years, and just doesn’t seem to happen so much these days. Management need people ready to go. Fresh bartending students straight out of training programs have a much better chance of getting hired over an untrained bartender with a pile of industry experience. How is that? Fine Art Bartending Graduates have NO bad habits, plain and simple. Our students show up to each class as if it were a job. 15 minutes early and their first task is to start opening procedures. For the 8 days we have our students, our instructors put them through their paces just as a bartending manager might do if they had the time. The only things our graduates need to do in a new establishment is familiarize themselves with the bar, cocktail menu, and where the supplies are, general operating procedures and company culture, then they are off to work. To become a great, professionally trained bartender you need a hands-on bartending course. In this day and age it is easy to try learning online. Before the internet, people were trying to learn from books and VHS tapes. This is a career option you need to learn by being present and physically working through each stage. If you want to be a bartender, do yourself a favour and take a bartending course with a school that cares about both the industry and your success.